Forty people came out to the Annual General Meeting at the Central Lions Centre. We reported on the activities of the last year and the new projects that are planned for the coming year. You can read the reports here. Our guest speaker of the evening was Kris Kendell from the Alberta Conservation Association. Kris introduced us to the amphibians of Alberta. We were fascinated to learn about their very specialized requirements for survival. For instance, toads dig themselves in for the winter in one place, breed in another, and spend their summers in yet other space. 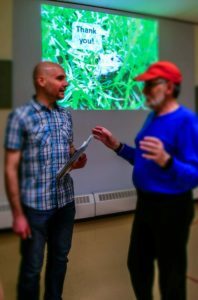 Kris showed us how they worked with one farmer to maintain a contiguous, undamaged space to allow toads to carry out their life-cycle. Even city dwellers can support amphibians by keeping yards that are less manicured and more inviting to amphibians. We could help out salamanders, which are known for falling into window wells and drying up. We can screen our window wells or leave a pile of leaf litter and check on them. By the end of the presentation, we had a new understanding and appreciation of amphibians in our world. 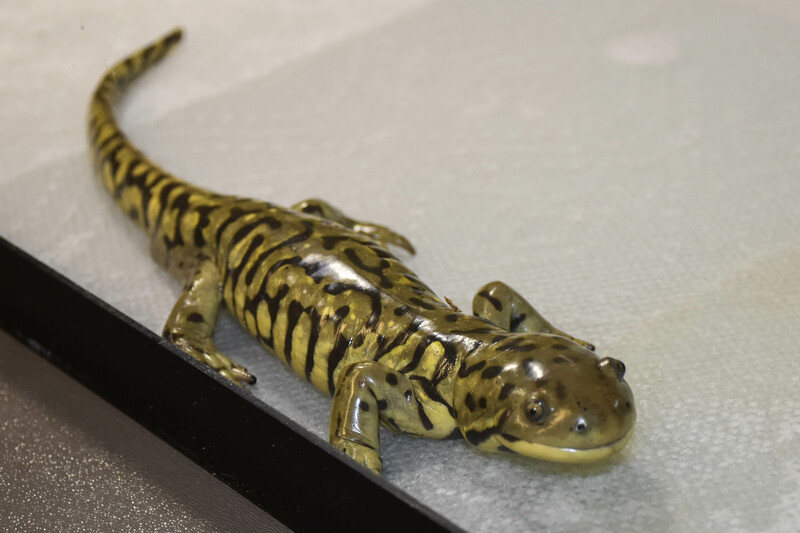 Here is one of the two rescue animals that Kris brought to the meeting – a tiger salamander.